This is a nice example of an advertising cover for an oil company. This SOCONY Motor Oil cover entered the postal system on 11th January 1933 from Mukden. These advertising covers are rare and this is a particularly nice example..
SOCONY is an acronym it stands for Standard Oil Company of New York, later in 1933 it changed its name. 4f was the correct letter rate at this time. 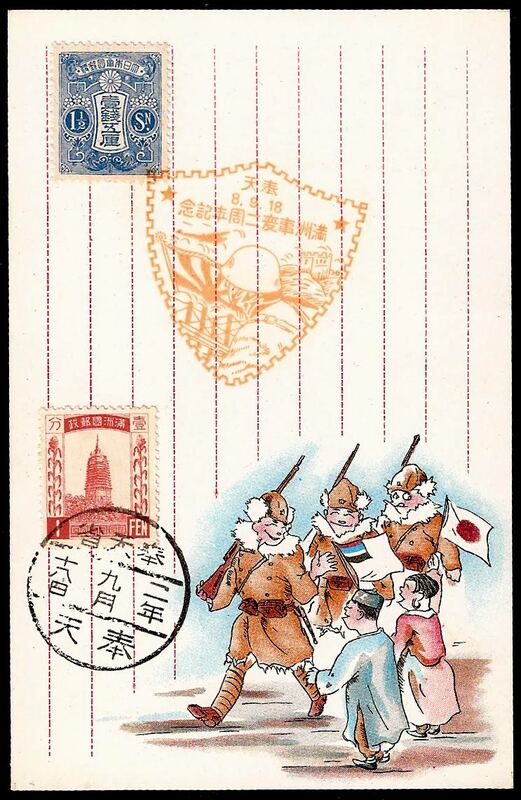 This is a nice example of a cover sent from the Japanese Post Office in Mukden to Shanghai in 1933. 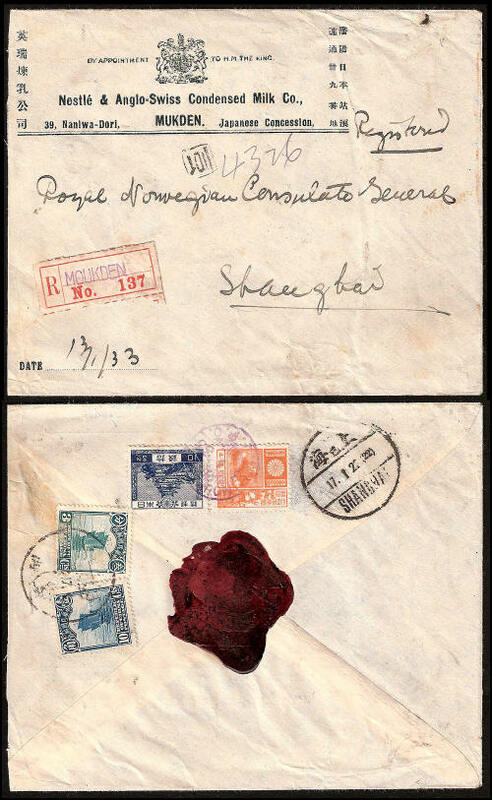 The cover carries a mixture of Chinese and Japanese stamps, the reason for this is a postal agreement dating to 1910. China would only accept mail that carried Chinese stamps showing the correct Chinese domestic postal rate, in this instance 5c (20g) letter rate + 8c for registration, a total of 13c. The rate applied by the Japanese SMRZ post office in Mukden was 4f (20g) letter rate + 10f registration, a total of 10f. To the best of my knowledge it was not possible to send registered mail to China through the Manchukuoan postal service at this time. 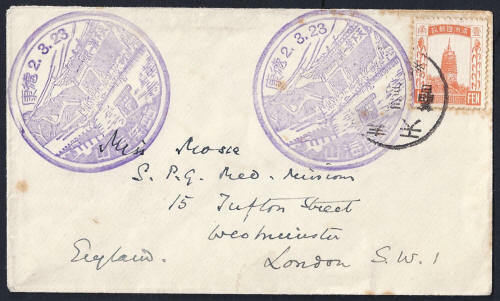 The postmarks tell us that this cover left Mukden on 13th January 1933 and arrived in Shanghai on 17th January, a transit time of 4 days. 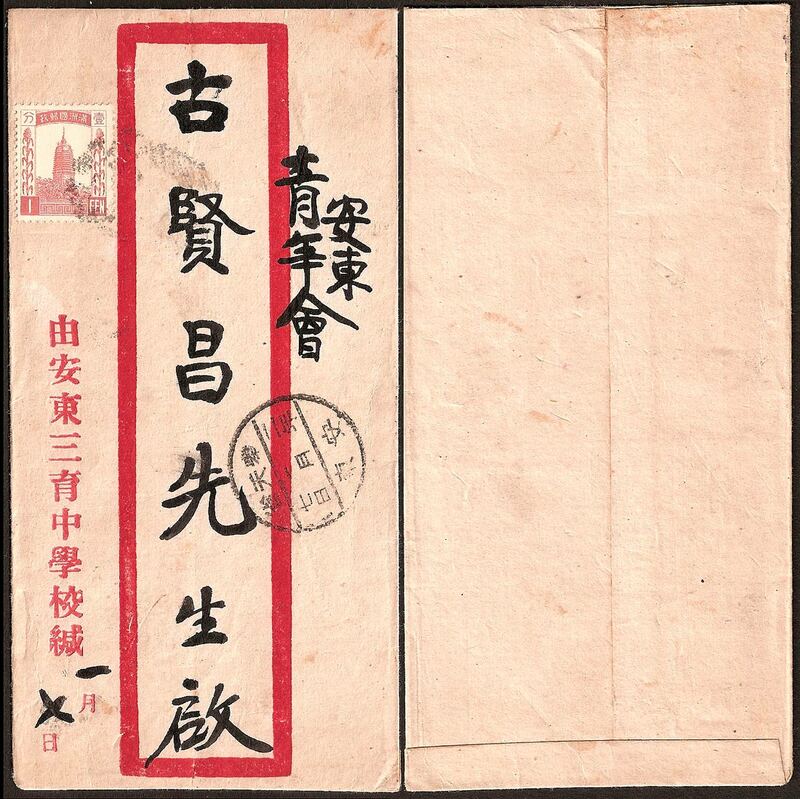 Philatelic 1st Anniversary Cover with Commemorative Cancellation - Mukden Post Office (Zirkle 3) 1st March 1933. The four central characters read "Perpetuity of Nationhood". 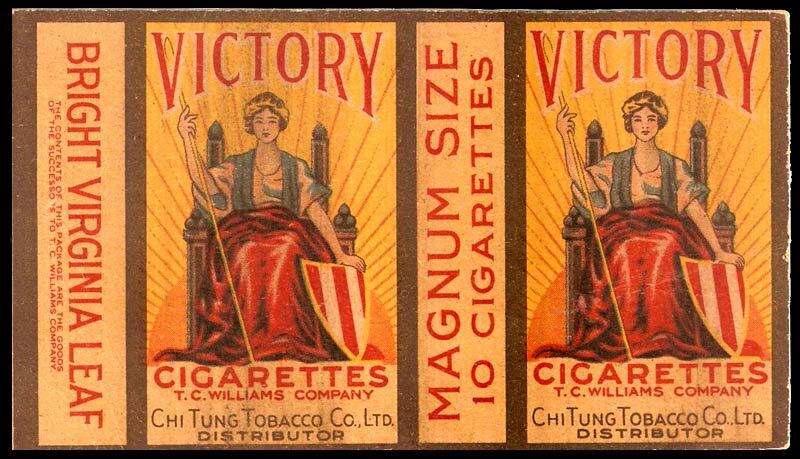 Two varieties are shown on this card so the stamps were selected carefully. 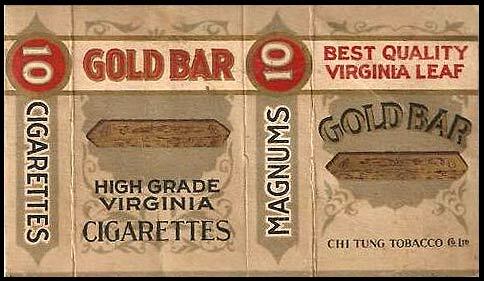 The envelope used is from the Chi Tung Tobacco Company, Established in 1930 and manufacturers of Gold Bar, Victory and Speed cigarettes. 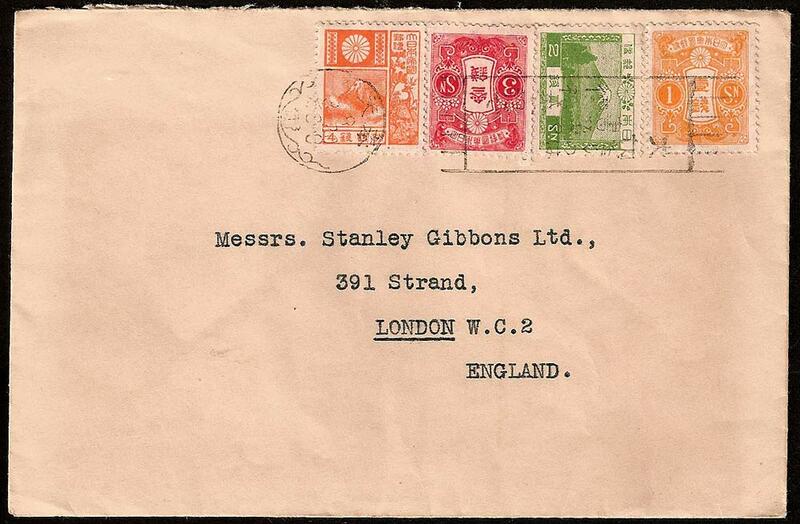 Posted 7th January 1933 this cover confirms that a local postage rate of 1f existed for letters. The cover was posted from Andong Sanyu Middle School 安东三育中学校, to a Mr. Gu Xian Chang (古贤昌) the YMCA, also in Andong. This rate, although not uncommon, seems to be ignored by most books and articles written in English. 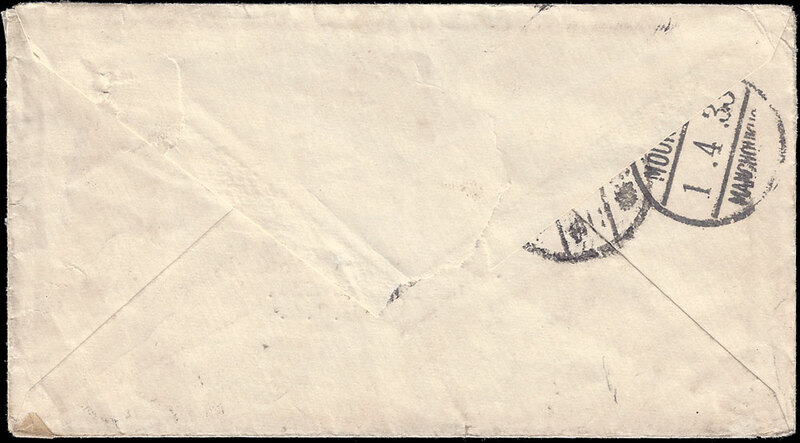 The first thing that you notice about this cover is that a stamp is missing you then notice the POSTAGE DUE 2 CENTS. SEATTLE, WASH. hand-stamp. So why was the charge 2c and what does this tell us? 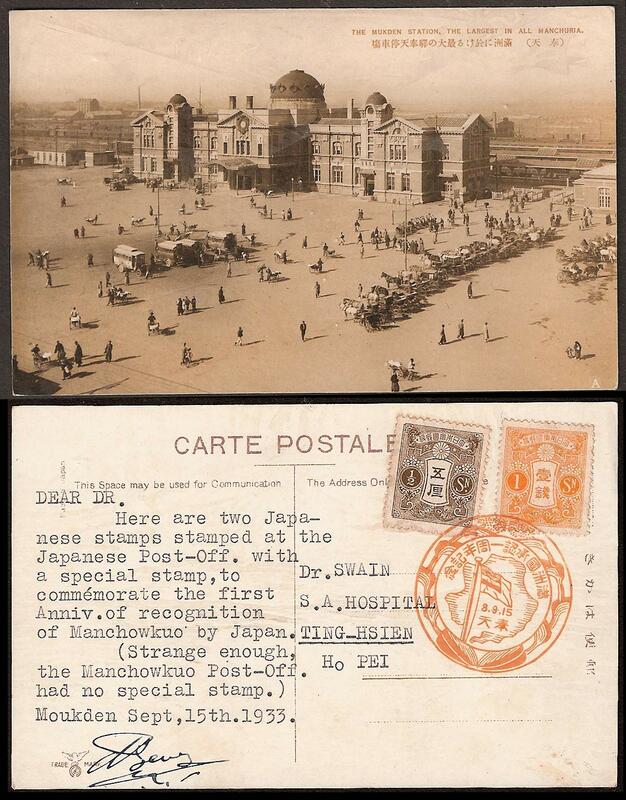 The letter entered the postal system in Harbin at the end of March 1933 and then went to Mukden where it arrived on the 1st April and both a local and an international cancel were applied on the reverse together with another indistinct postal marking. 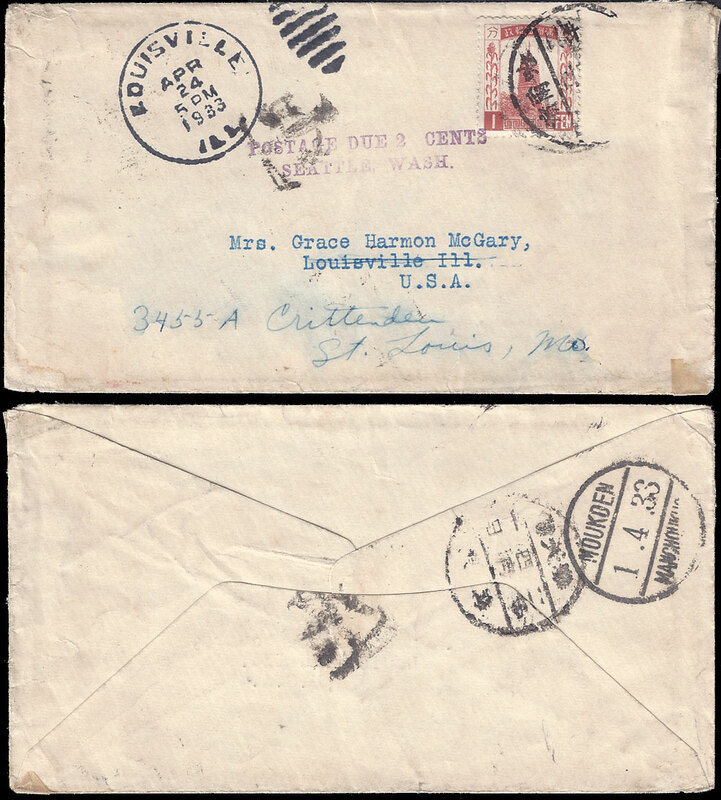 The letter travelled by the Pacific route and the arrival postmark in Louisville shows that the transit time (excluding the re-direction) was about 25 days. 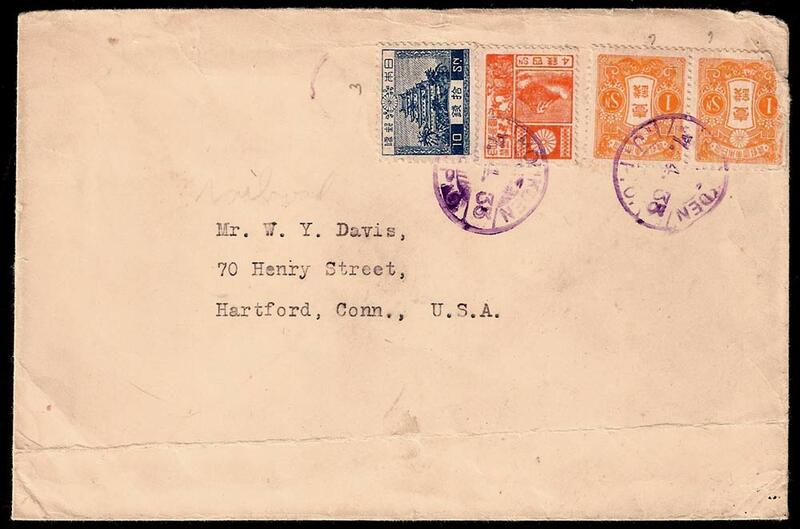 In March of 1933 an international letter would require postage of 25f. A 1f stamp is present on the letter and the second stamp could not have had a value of 24f because no stamp of this value existed. This leads me to think that the cover may have been treated as Printed Matter, the contents were clearly of little importance as the envelope was not sealed, the flap of the envelope would have been postmarked had this been the case - see here. 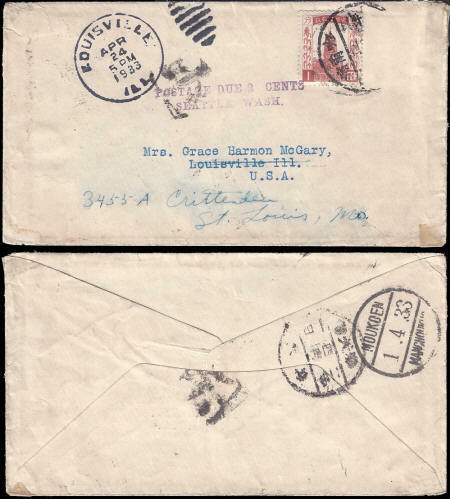 Research shows that Grace had worked as a missionary in Korea and China and so it is possible that the envelope contained a religious tract or something similar. Had this been the case the charge would have been 5f (a 4f stamp existed and is probably what is missing) and this would also explain the 2c additional charge made when the letter reached Seattle. This cover was sent from Hai-ch'eng on 7th July 1933 by Director: Sung Yao Chiai who operated the Ming Lang stamp dealership. This is the earliest cover from this company that I have seen to date. 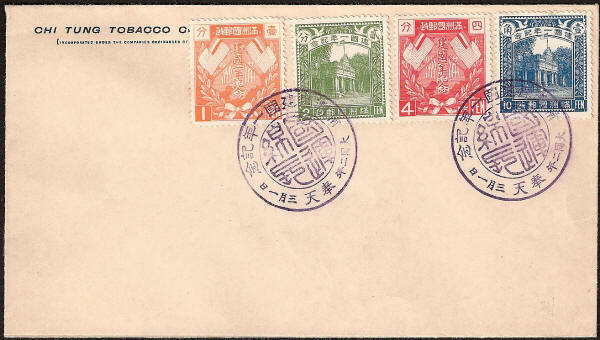 The cover carries a native Chinese postmark with the characters 海城 for Hai-ch'eng in the lower segment. The reverse side of the envelops has a variety of hand-stamps including Printer Matter in both Chinese and English (similar to the cover below). Written in blue pencil is 美國 meaning "United States" added by Mr Sung to help postal workers unable to read English. The postage rate of 5 fen was the correct rate for this date. Sadly there is no American arrival postmark so the transit time is unknown. It would probably have taken up to 30 days to reach its destination. 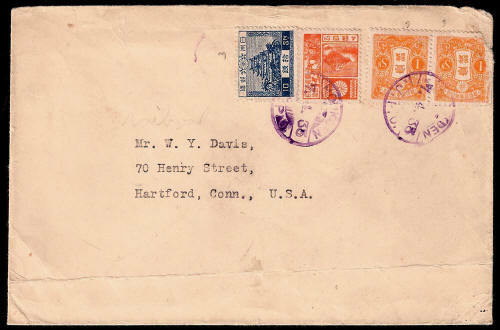 This large cover was sent from Hai-ch'eng on 1st November 1933. 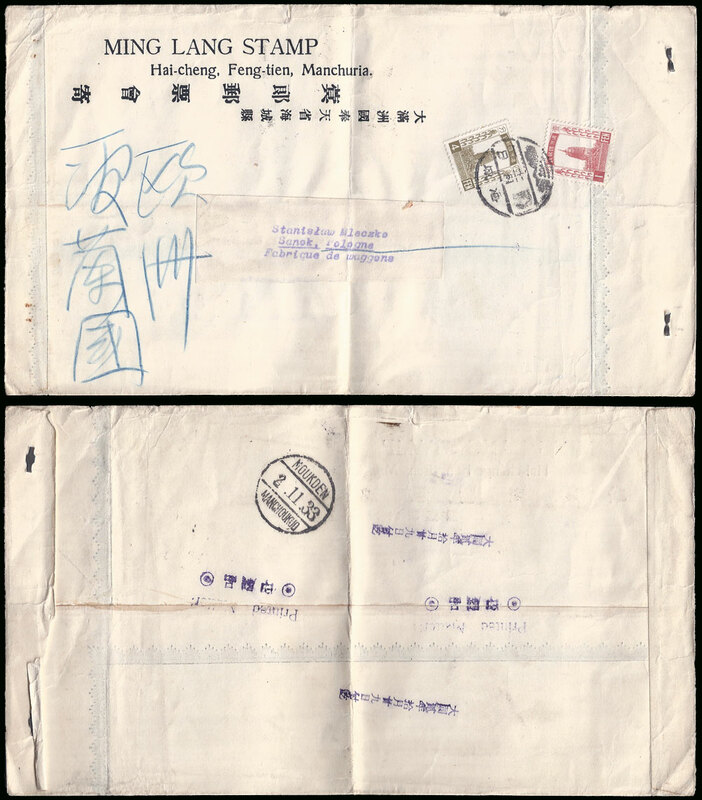 From Hai-ch'eng the cover travelled by train to Mukden Post Office where it received an international postmark on 2nd November 1933. It was then sent onward to Sanok in Poland. The blue pencil marks indicate 波蘭 "Poland". The postage rate of 5 fen was the correct rate for this date. Sadly there is no Polish arrival postmark so the transit time is unknown. It would probably have taken about 20 - 25 days to reach Poland. Dated 15th September 1933 - This card is one of a series known to have been posted to Dr Swain (who was clearly a keen collector). The two Japanese stamps used indicate a price of 1½s, this made posting a card from the Japanese SMRZ Post Office slightly cheaper than sending it from a Manchukuoan Post Office. The Japanese Post Office used Japanese Postal Rates. In this instance the card was posted from Mukden to a Salvation Army Hospital in China, one can only guess at what the Chinese postman thought of this cancel. 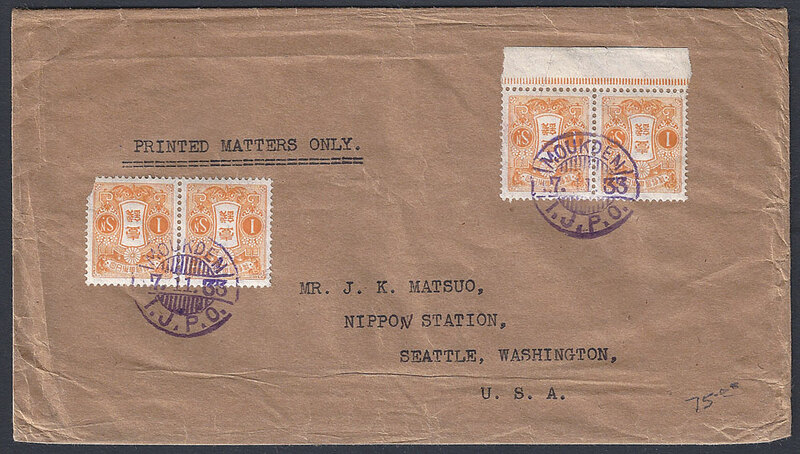 Dated 17th November 1933 - This is the second of two Nippon Station covers I have found, both sent to Mr J. K. Matsuo. To see more information about Nippon Station and J. K. Matsuo see the previous page. This cover was sent from the I.J.P.O. 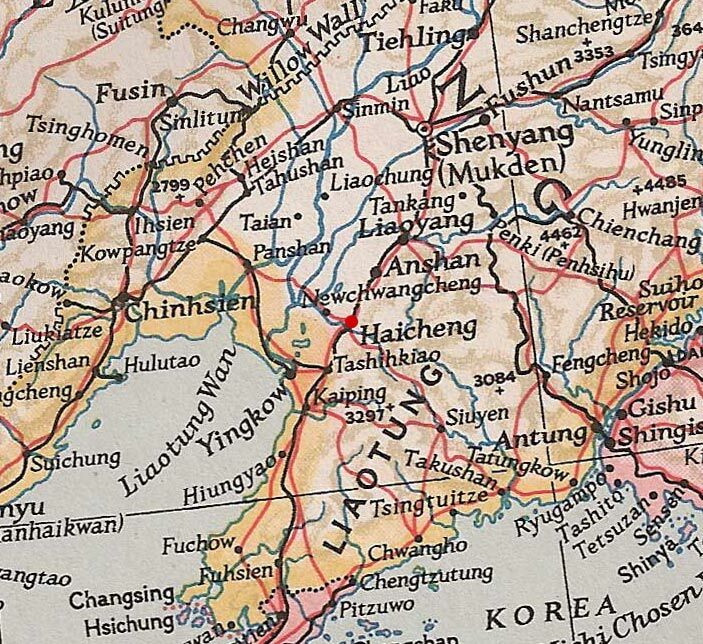 post office in Mukden and is an example of double weight Printed Matter, meaning that it would have weighed over 50 grammes. 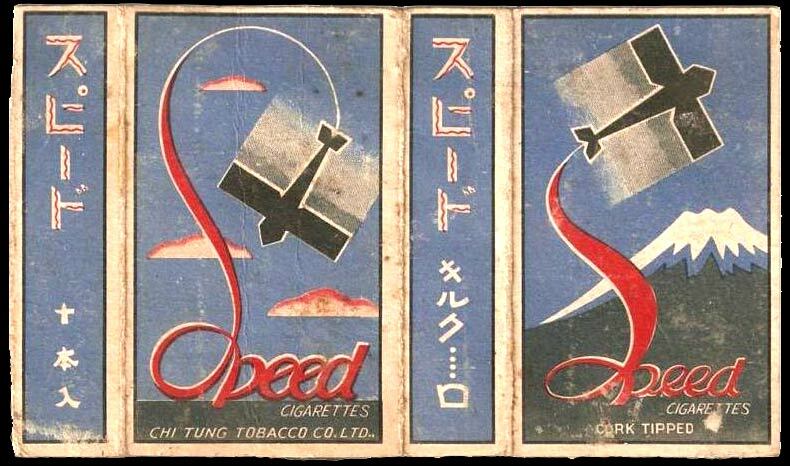 This card is dated 18th September 1933 an was issued at the Japanese SMRZ Post Office in Mukden. It shows the Chinese style Fengtian cancel together with the SMRZ special cancel to celebrate the 2nd anniversary of the Mukden Incident. 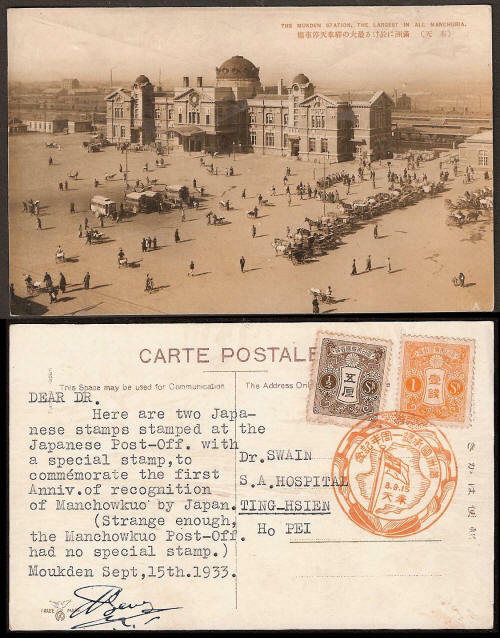 It has not been sent through the post but an interesting philatelic item because it indicates that the 1f local postcard rate could not be obtained at the Japanese SMRZ Post Office in Mukden, making this one of the few items that cost more to send from here. This standard weight letter sent to the stamp dealer Stanley Gibbons in London cost the sender 10s when posted from the Japanese SMRZ Post Office in Mukden. 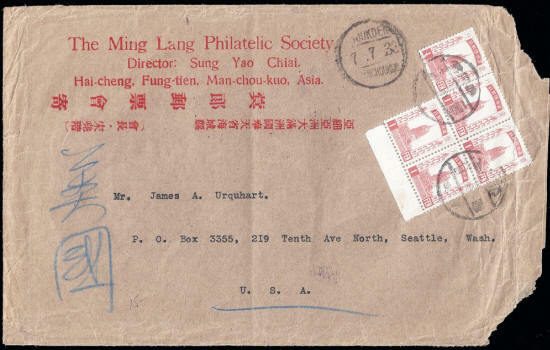 The same letter would cost 25f when posted from the Manchukuoan Post Office, a huge saving. In practice only Japanese citizens and foreigners used these Post Offices. The mail would have travelled through the main I.J.P.O. Office at Dairen. According to the machine cancel the date of posting was 30th March 1933. This is a letter from the I.J.P.O in Mukden to the USA. The rate of 16f is the Japanese International Rate for a letter of 20g at 10s plus 6f for an additional weight of up to 20g. This rate was adopted in Manchukuo from 1st January 1934. The violet colour of the ink indicates that a rubber dater was used, metal daters used black ink. The letter is dated 7th April 1933 and would have had a transit time of about 20 days. The cover has no arrival postmark. 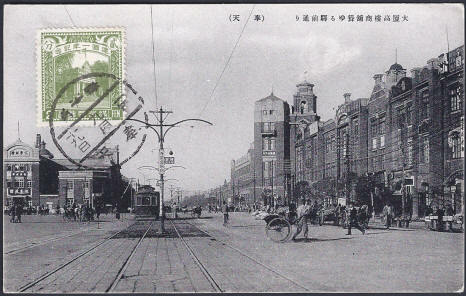 The above postcard showing a picture of a busy street in the City of Mukden carries a native postmark dated 19th September 1933. The card is unaddressed and the 2f stamp is correct for a card sent to another domestic town or city at this time. 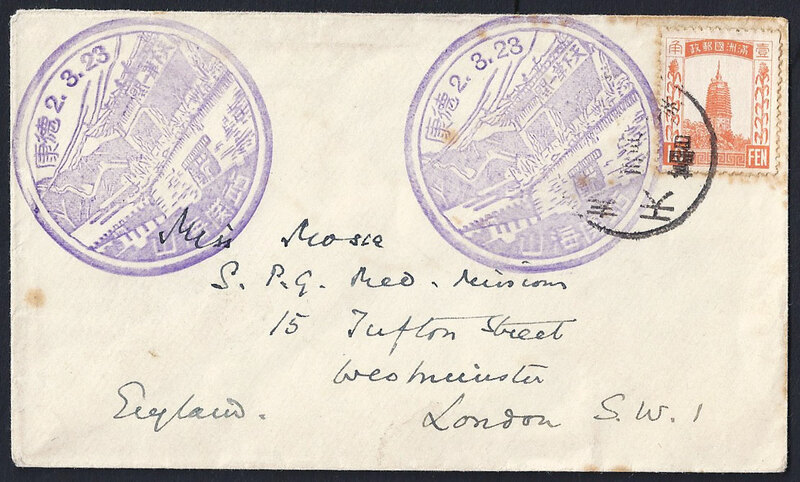 This cover was posted from Mukden to London, England on 24th March 1933, the sender had seemingly been travelling in China as the impressive 山海關 Shan-hai-kuan Station hand-stamps show. The hand-stamps were applied at the border the previous day. 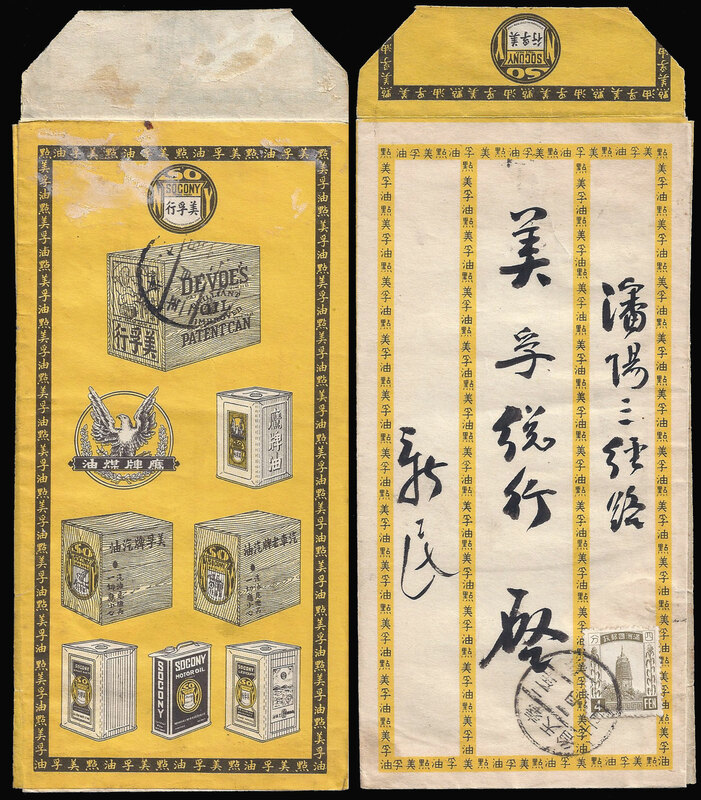 It may be that the sender left the train for a few minutes to apply these souvenir hand-stamps himself before resuming his journey into Manchukuo. These attractive hand-stamps were available at stations and other tourist attractions, they were free to use and added to the fun of the journey. They have no postal significance. The postage of 10f is correct for this time.